The Reina Beatrix International Airport is a state of the art facility with all the amenities of any leading international airport. Named after the Queen of the Netherlands, it was renovated a few years ago into one of the most plush and luxurious set ups in the Caribbean. Unlike the airports of most cities, the Aruba International Airport is not located miles away from the city. It is just 5 minute drive from the city center which can be easily accessible by car, bus or taxi. Most of the hotels are about 15 to 20 minutes away making them equally convenient to reach and depart from. Getting To and From the Airport. The arrival centers and departure centers are easy enough to find. There are a number of bus services just outside the airport offering you a means of transit to the hotel areas or city center. If you prefer a less public form of transport, taxi services are also available just outside the terminal. Car rental agencies are well represented at the airport so if you independent mode of travel is your choice, check in with the car rental desk. 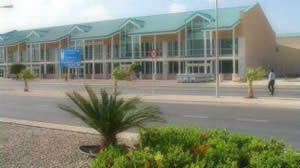 The Aruba airport has all the modern amenities of a luxurious and comfortable airport. There are a number of stores and eating areas offering passengers some entertainment during the lag times between flights. The food offered here represents a range of cuisines so that you can take your pick from any culinary preference you choose. There are also a few bars allowing travelers the chance to have a cocktail or two while waiting for their flight. All the major shopping brands and high end luxury items have a presence in the airport providing you the opportunity to pick up something special or just browse around to pass the time. The Reina Beatrix Airport has a US-bound terminal with its own customs and immigration counters. As a result any flight out of the Aruba into the United States are treated as domestic flights into the US. The benefit to travelers heading to the US is significant. On arrival in the United States, they do not have to go through the lengthy immigration queues and customs process. Since the formalities were completed in Aruba, they can walk out of the airport after collecting their luggage. All the major airlines fly in and out of Aruba. The airport can accommodate any commercial aircraft as large as the Boeing 747. A number of charter services also fly in and out of Aruba from different parts of the world and the airport is well equipped to handle the traffic. Pets are more than welcome as traveling companions in the Reina Beatrix Airport; however, they should be accompanied by a Certificate of Health issued within 30 days of entry into Aruba. The airport in Aruba is a comfortable, convenient and efficient center of travel. The amenities are well appreciated and most travelers have an enjoyable experience here.